Are the government’s large-scale developments in southern Ethiopia forcing local populations to move with the times or just move out the way? Nyangatom people by the Omo River. Photograph by William Davison. 5 For the greater good? A short stroll away from the bloated Omo River in Ethiopia’s far south, a new type of settlement is forming on the outskirts of Kangaton, a frontier town occupied by Nyangatom people and highland migrants. The empty domes are traditionally built: bent sticks lashed together with strips of bark and insulated with straw. But instead of the typical handful of huts ringed by protective thorn bushes, hundreds of new homes are clustered on the desolate plain. This is a site in the Ethiopian government’s villagisation programme, part of an attempt to effect radical economic and social change in the Lower Omo Valley, an isolated swathe of spectacular ethnic diversity. Agro-pastoralists such as the Nyangatom, Mursi and Hamer are being encouraged to abandon their wandering, keep smaller and more productive herds of animals, and grow sorghum and maize on irrigated plots with which officials promise to provide them on the banks of the Omo. The government, now rapidly expanding its reach into territory only incorporated into the state a little over a century ago, says it will provide the services increasingly available to millions of other Ethiopians: roads, schools, health posts, courts and police stations. But critics, such as academic David Turton, argue that this state-building is more akin to colonial exploitation than an enlightened approach to the development of marginalised people. Longoko Loktoy, a member of the Nyangatom people, says all he knows is herding, as he carves a twig to clean his teeth, occasionally glancing behind to check the movements of his sheep and goats. But, he adds, “our educated boys under the government structure” have told him life in the resettlement site will be better. Longoko says his family straddles two worlds, with some of the children from his two wives receiving education in regional cities and others raising animals in the Omo. In line with his “educated boys”, he says security and services will improve in the commune, but wants to retain the option to move to high land or to the Kibish River when the Omo runs low. “I don’t think the government will tell us not to move”, he says, a Kalashnikov slung over his shoulder. Nearby, boys hunt doves by firing metal-tipped arrows from wooden bows, while women, their necks swaddled in a broad rainbow of beads, begin a long trudge back from the Omo with jerry-cans perched on their heads. 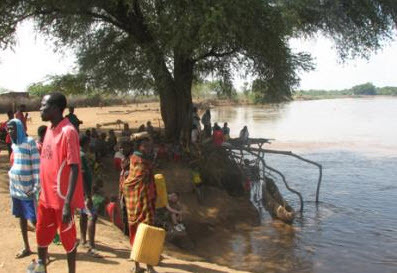 Longoko is unaware of plans for the under-construction upstream Gibe III hydropower dam to control the flow of the Omo River, ending the annual flood that leaves behind fertile soil for locals to cultivate on when waters recede. The regulated flow will be used for the country’s largest irrigation project: 175,000 hectares of government sugar plantations, some of which will occupy Nyangatom territory. “Even though this area is known as backwards in terms of civilisation, it will become an example of rapid development”, was how former Prime Minister Meles Zenawi announced the scheme in 2011, heralding the final integration of the people of the Lower Omo into the Ethiopian state. In 1896, Emperor Menelik II led Ethiopian fighters to a famous victory over invading imperial Italian forces at the Battle of Adwa – the key moment in the ancient kingdom’s successful resistance to European colonialism. A year later, it was Menelik’s turn to expand further, as he sent his generals out to conquer more of the lowlands to the east, west and south. An account of the subjugation of the Lower Omo area was provided by Russian cavalryman Alexander Bulatovich, who Menelik, an Orthodox Christian like many Ethiopian rulers, invited to accompany his general, Ras Wolda Giorgis, on the offensive. The invading highlanders faced little resistance as they marched from the recently-conquered Oromo kingdom of Kaffa, a place Ethiopians claim to be the birth of coffee, according to an account of the trip translated by Richard Seltzer in Ethiopia Through Russian Eyes by Alexander Bulatovich. “If you don’t surrender voluntarily, we will shoot at you with the fire of our guns, we will take your livestock, your women and children. We are not Guchumba (vagrants). We are from the sovereign of the Amhara (Abyssinians) Menelik”, the Ras told local chieftains when he arrived in an area slightly to the south of Nyangatom territory where the Omo flows into its final destination, Lake Turkana, which mostly lies in Kenya. Anthropologist David Turton from the African Studies Centre at Oxford University has been visiting the Omo valley and particularly the Mursi people since the 1960s. He sees the current approach of the ruling party to development and state-building in the south, with its “civilising mission” and “racist overtones”, as similar to that of previous regimes, going back to Menelik. Schemes imposed from the centre that force people off their land are bound to create resistance, he believes, although direct, violent forms of protest are inconceivable given the overwhelming power of the state. In the past, there was space for people like the Mursi to move out of the way of the state. Today, he says, they know this is impossible. At the core of Turton’s dismay are the accumulated findings of research on ‘development-forced displacement’. This shows, he says, that people who are forced to move to make way for large-scale development projects always end up worse off than they were before, unless concerted efforts are made to prevent this. “Ideally the government would have taken them into its confidence from the start, given them full information well in advance, fully consulted them about its plans, included them in the decision-making, and provided proper compensation for the loss of their land and livelihoods” he says. But instead, Turton claims, none of this has happened, and the result will be increased poverty among the many ethnicities that populate the Omo valley. That was the fate of Oromo and Afar pastoralists when Emperor Haile Selassie applied a similar top-down method to Ethiopia’s first major river basin development on the Awash River in the 1960s, he explains. Marking a departure from the past, the ruling Ethiopian Peoples’ Revolutionary Democratic Front (EPRDF) argues that since it seized power in 1991, it has empowered rather than oppressed the over 80 ethnic groups that live in the Horn of Africa nation. This is done through an innovative system of ethnic-based federalism that enshrines the right of each group to govern itself and protect its language and culture. Critics, however, counter that centralised policymaking and the de facto one-party system that maintains political control denies autonomy for regional actors. This tension can be seen in attitudes to nomadic people: while Ethiopia’s 1994 constitution guarantees pastoralists the right to grazing land and not to be displaced, previously in 1991, the EPRDF adopted a policy “to settle nomads in settled agriculture”, according to a Human Rights Watch report from that year. In the official narrative, sugar plantations and the new communes in the Omo are consistent with ethnic federalism, as they will reduce poverty and bring some trappings of modernity to minority groups. This stance is reinforced by pro-government media such as the Walta Information Center, which, in a recent article, presented the projects as unanimously welcomed by local people. “We had no strength when we have been living scattered. Now we have got more power. We are learning. We are drinking clean water”, Walta quotes Duge Tati, a local in Village One, as saying. Another villager was said to aspire to own a car. However, reports from advocacy groups such as Human Rights Watch and Survival International present a starkly opposing view on recent development in Omo. They contain countless accounts from locals detailing how they’ve been coerced and beaten into accepting policies that steal their land and ruin their livelihoods. The Nyangatom have historically been so peripheral to Ethiopia’s highland heart that in 1987 the Kenyan government bombed them with helicopter gunships in the Kibish area after a particularly murderous bout of ethnic clashes. Colonel Mengistu Haile Mariam, Ethiopia’s nationalist military dictator at the time, allegedly assented to the operation. Today, officials from Kangaton, the administrative capital, have to take a boat across the Omo to attend meetings with regional bosses. Despite this isolation, the impact of missionaries, traders and government is displayed in aspirations for services and technology, and the adoption of non-traditional dress and cuisine – at least among some people living in or near Kangaton. Lore Kakuta is a Nyangatom who became a Christian after attending school run by missionaries. He is also the security and administration chief for the Nyangatom-area government. Wearing a replica Ethiopian national football team shirt and a head torch bought in Dubai, he sketches out the plans for irrigated agriculture and a shift to cows that produce more milk. Lore is uncertain about how much Nyangatom land will be lost to sugar plantations. And he is clueless about the hundreds of thousands of migrant workers that it is said will soon be attracted to the area, and the impact they could have on his people’s welfare and their constitutionally-guaranteed rights. Nyangatom culture is strong enough to withstand any influx, he says, weakly. As a meal of goat stew mopped up with flat bread from the Tigrayan highlands is served, he explains how the traditional culture has changed already, mainly due to the influence of missionaries. So for Lore, the imminent transformation is nothing to worry about.